Kerensa: Unlike the pilot movie, this week’s episode “Wonder Woman Meets Baroness Von Gunther” didn’t drag at all! However, I have come to the conclusion that literally everyone on this show is smarter than Steve–thus far he has not proven himself to be much more than a himbo who can occasionally punch things. But I thought this was overall a pretty solid episode, which had a lot of my favorite elements from the pilot movie–and brought up some interesting questions about power, the good girl vs. bad girl dichotomy, male ideas equal superiority, and I think should begin our count/drinking game of how many times per episode Diana spins into Wonder Woman. Also, it was written by a lady! 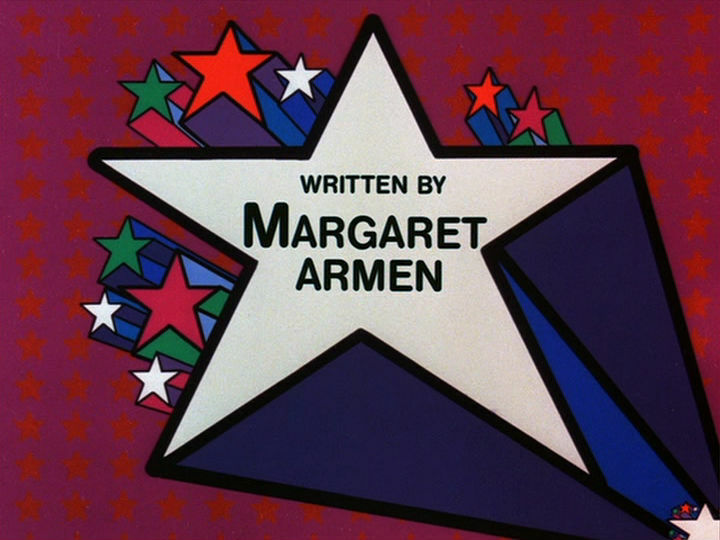 Margaret Armen, who wrote episodes of shows such as Star Trek and The Bionic Woman. What were your initial thoughts about the episode? Noel: It is amazing what an extra 30 minutes can do to your runtime, isn’t it? I liked the episode as well, and I likewise enjoyed them using a classic Wonder Woman foe from the character’s stories from the World War II era. I particularly dug the intrigue of the Baroness manipulating things even from prison and that the Nazis have managed to infiltrate even the highest echelons of industry with Arthur Deal III. It was all so pulpy and fun, even if I thought that the little kid was a bit of a drag on things; but he was cute, so who cares? I want to hear about this male ideas equal superiority though. I agree that Steve seems pretty dumb, even though he’s the one who seems to get to do all the investigating (that the warden’s son doesn’t do for them). And it’s not like he’s playing dumb, just that he’s not the brightest bulb in the box in general, but thank goodness Diana is there to give him a little bit of guidance. Kerensa: You thought the kid was a drag? I hate kids and I actually liked him. He’s way smarter than Steve. I was hoping that Wonder Woman would be his mentor or something. Well, not superiority, but I guess I mean like we obviously know that Diana is feeding Steve all his ideas and then he gets all the glory, which I mean she probably doesn’t want, but it was just annoying to me. Specifically the scene, where Diana tells Steve that they should go to the prison to question the Baroness and Steve’s response was just the worst: “That’s what I intended to do, Diana.” And in response to something a couple minutes after, he said “I suggest…” Maybe it was just the tone, but that’s kinda where that came from–the idea that since it was his “idea,” that somehow it was superior than if it was Diana’s? Maybe I’m reading too much into it, but just that level of mansplaining that seems to permeate his interactions with Diana and basically all other women (Baroness) really bothers me. Like can we just get rid of him already? Noel: For your drinking game: She spins two times. I get that Diana may be downplaying her intelligence and abilities to better blend in, Clark Kent does the same thing by being comically clumsy, after all, but I don’t know that the episode demonstrates a side of her that contradicts the Diana Prince persona, to provide a counter example to the, borrowing the Baroness’s words, “plain and uninteresting [woman] whose complexion is rather like wet Bisquick” and is “blind as a bat without those glasses.” And the most Steve can muster up is that she’s “hard-working” and “totally loyal.” I mean, she even claims to have gotten lost trying to find her way back to the cell block. Believable, sure, but she could’ve asked for directions! Even Clark gets to beat Lois to a byline every now and then to keep up the pretense that he is a good reporter. What do you make of the Baroness? She puts on a similar front of weak femininity in front of Steve that Diana does, but she’s tough as all get out, commands a massive amount of respect from her partners and subordinates in the episode, and even gets to yell at Arthur due to the botched munition barn plan. She may be locked up (well, sort of), but she’s clearly in charge all the same. It’s a decidedly different sort of femininity from the one Diana presents, and on a Nazi, too. Kerensa: I kinda love the Baroness. 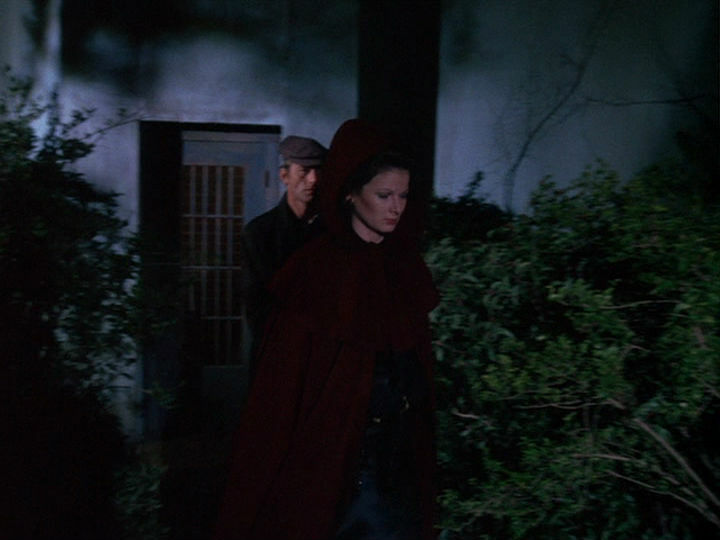 Beyond her excellent taste in clothing–that red cape, that sequined dress thing–all screaming film noir to me, she represents a femininity that is completely different from what Diana presents especially because while we know that both of them are in charge–the Baroness really presents that–she’s not going to be a shrinking violet. She clearly has a tremendous amount of power which is interesting considering Diana’s comment re: democracy/valuing women from the pilot movie because both women are using their power within institutions that don’t value them. I agree that she puts on that weak femininity in front of Steve–mostly because I believe she knows he’s dumb enough to fall for it. And it’s a femininity that’s very much rooted in sexual power, I think, we know Steve finds her attractive (they were sleeping together in the pilot movie right?) so it operates in continuing to dumb him down, if even possible. We see men like Steve and Arthur essentially working as white dude figureheads with women like Diana and the Baroness as the brains behind the operation. What do you think about her? Also, something else that came up for me is that there seems to be a good girl vs. bad girl dichotomy set up between Diana and the Baroness. And this goes from the aesthetics (particularly the costuming), beliefs (democracy versus totalitarianism) and even in the ways they subtlety mold Steve. I’m curious to see, if depending on how large a role the Baroness continues to play, how this might play out. Any thoughts? Noel: I really like the Baroness as well. That cape is fierce. I don’t recall a mention of Steve and the Baroness sleeping together…Maybe I missed it…I don’t think she’s back either, but I could be wrong. My other response to the Baroness feeds in to your last question about good and bad girls: I do think that the show sort of poses the Baroness’s power as a problem. Diana chastises her for her “unwomanly mistakes,” which I assume it as being taking part in the Nazi plans, but it positions her place in the power hierarchy as not being feminine. Yes, much of Wonder Woman’s particular brand of feminism stems from compassion, and the Baroness’s does not, but does that make her unwomanly? Is feminine power best in a supporting role and not a command role? I mean, Arthur may be the figurehead to implement the plans and by the high-profile spy, and he and the Baroness speak roughly like equals, but she’s also in charge. It might be a good time to point out that the episode introduced another female character, though it left her without a name. The woman with Blankenship, eating cake, was Etta Candy. Diana may be putting on a mask to blend in and occasionally exercise her ideology, and the Baroness may be mixing all sorts of flavors of feminism to achieve her goals, but Etta’s just there. Eating cake and looking worried. At least the show isn’t endorsing her. Kerensa: Those are all super interesting observations especially on where feminine power is placed–I’ll be interested to see if that’s a position that wavers as Diana gains power and especially if we get the Baroness back or any other female villains. Interesting. Is Etta Candy in the comics at all? Is there anything else that stood out for you in the episode? Noel: Oh, we’ll have a number of female villains, I think, including next week! Early on in the comics, many of Diana’s foes were women, but posed as men, including Doctor Poison and Hypnota. Crazy times, the 1940s. And Etta is in the comics. Golden Age version of her, she was a rotund woman obsessed with sweets and led a college sorority of girls who helped Wonder Woman in her adventures, so not exactly the woman we see here, but the love of sweets is there. She changed over time from this version, to a woman conscious about her body to demonstrates those struggles, and then a competent military intelligence officer. With the new relaunch, she’s thin, African American, and Steve’s secretary. Not much else stood out. I do think that Lynda Carter is a horrible runner, but she’s also running in high heel boots, so I probably shouldn’t judge. Even Tom Cruise probably couldn’t run in those boots. I did find it interesting that only the Baroness ended up in the pool. You just know that if this were filmed today, they both would’ve ended up in there. And speaking of that final scene, did Diana give her away identity? I mean, how does Wonder Woman know that the Baroness was reading about democracy in prison?! Kerensa: I am so glad for your comic knowledge during our reviews. I wonder if Etta is going to become a bigger part in this show. Oh they totally would have ended up in the pool together in some sort of wet-t-shirt contest/power struggle. SERIOUSLY?! Wonder Woman, not a sly move. I mean unless she’s “secret friends” with Diana–but yeah she completely gives herself away but judging from Steve’s facial expression–I highly doubt he caught on at all. Noel: Because Steve’s a total himbo. Next week: “The Nazi Wonder Woman.” And maybe we’ll talk about the book. But we’re not making promises. 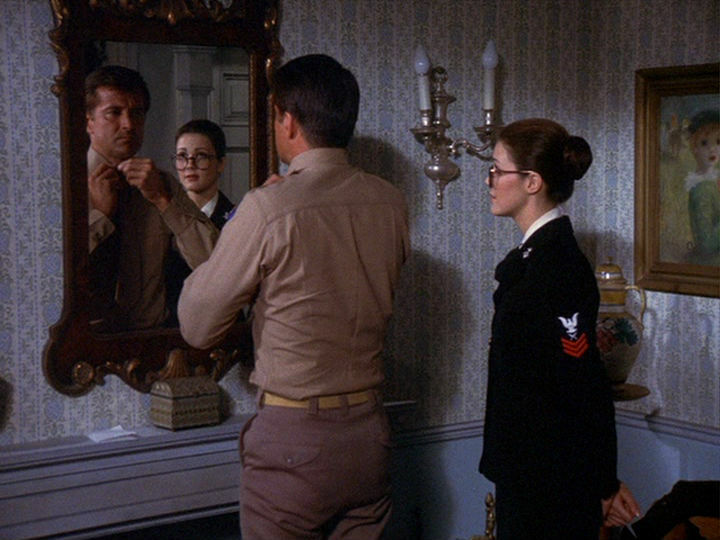 I suspect the “himboization” of Steve Trevor was purposely intended by Stanley Ralph Ross, a very good writer who developed WONDER WOMAN for television, as something of a spoof. It wasn’t uncommon then or now in male-dominated action series to have a slightly dim but gorgeous woman hanging around whose job was either to get kidnapped or to serve as an audience surrogate by asking the hero the questions about the plot it was imagined we were asking ourselves. Lyle Waggoner, who had been doing comedy on THE CAROL BURNETT SHOW for years (and screen-tested to play Batman (!) in the series that starred Adam West), would have known how to play Trevor with that kind of tongue-in-cheek attitude. So I don’t believe we were ever supposed to take Steve Trevor seriously except as a lummox for Diana to, again, rescue or ask dumb questions. I don’t doubt the intention of the role reversal, but there’s the issue of gender dynamics here that don’t allow that inversion to play the same way. Steve may need to be need rescued by Wonder Woman, but he gets to appropriate ideas from Diana as his own, sometime I’m not entirely sure would get to happen in the original binary you’ve outlined. And it’s not really being played for laughs as I don’t think like the show plays Trevor for too much of an outright fool; he’s just sort of somewhat inept while the show keeps insisting that he’s a vital part of the war effort for some reason, and I don’t think any of it comes off as overly tongue in cheek. And even if the character isn’t intended to be taken seriously, his role in dynamics of the show should be taken seriously, and all that that may entail. Interesting feedback. It has been many years since I’ve seen the show (even though I have had the DVD set on my shelf for years). I should pull the discs out and watch along with you to get a fresh perspective. It’s undeniable that the series as a whole was played tongue-in-cheek. BTW, I don’t remember if this has come up in your discussions, but Lynda Carter is really phenomenal in this show–really, the perfect combination of actor and character. She looks the part more than probably any other actress ever could have, and her earnest acting style is expertly suited to the material as written. Even when the scripts are soggy (and they will get soggy), she is always believable, honest, and likable. We discussed Carter’s performance a bit in regards to the pilot movie, and we highlighted the earnestness in regards to all the comedic actors they filled that movie with. Are you guys trying out for Jezebel or does your hatred of men just come naturally?